A valid fishing license is required to possess this species for bait or food. We would like reports from the northeastern half of Iowa. 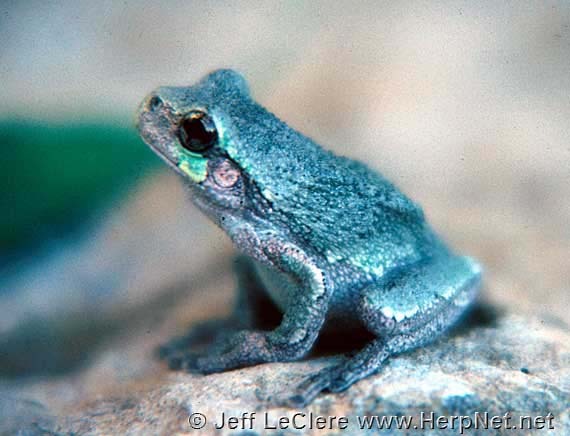 The Cope’s gray treefrog is one of two look alike species of treefrog in Iowa. This species is about 2 inches long snout to vent. They can change from a bright green to gray (almost brown) in seconds. Unlike eastern gray treefrogs, Cope’s gray treefrogs often do not have a pattern on their backs. If the Cope’s does happen to have a pattern on the back, the pattern is often not bordered by black (but see below). The belly is white and usually unmarked. The throat may be dark in males. The insides of the thighs and legs are washed with bright orange or yellow. They have relatively smooth skin and large toe pads. This identifies them from several other species of Iowa anurans. The Cope’s gray treefrog is identical in appearance to the eastern gray treefrog. There is (as of now, anyway) no reliable way to distinguish these frogs based on appearance on a consistent basis. The pattern on the backs of each species is unreliable as they both may or may not have a pattern; observations based on positive identification indicates that one has a pattern more often than the other. The only steadfast differences between these two species is the number of chromosomes (the Cope’s gray treefrog is a diploid, the eastern gray treefrog is a tetraploid), and that the Cope’s has smaller red blood cells than the eastern gray treefrog, and dfferences in the advertisement calls of the males (see habits). There are no subspecies of Hyla chrysoscelis recognized. Cope’s gray treefrog is probably found throughout the state. Because Cope’s gray treefrog and eastern gray treefrogs were once considered the same species, historic records of this frog are unclear. Cope’s gray treefrogs are reported to prefer more open habitats such as prairies, open grasslands, and oak savannas than the gray treefrog. I have found this to be true as I have heard this species calling on prairies with the noted absence of eastern gray treefrogs. Both species may be found together in forest edges and at night around lighted buildings in towns. This treefrog is well known for its climbing ability. It can scale most surfaces, even glass, with the use of its enlarged toe discs. Each ‘disc’ secretes a mucous that creates tension between the disc and the surface. This enables the frog to cling to smooth surfaces. They breed from May to July. They use permanent or semi permanent wetlands to breed, including flooded agricultural fields. The males call from vegetation in the water. The call is the best way to distinguish this treefrog from the eastern gray treefrog in the field. The Cope’s gray treefrog’s call has a fast trill, and sounds much more mechanic (less musical). It sounds like a duck’s quack with a trill to it. Tadpoles have a red tipped tail, unique among Iowa’s other tadpoles. Tadpoles transform in 2 to 2 1/2 months. They are always bright green when they transform and will remain so for some time. Color change in adults varies depending on temperature, activity level, and color of surroundings. Adults migrate to summer feeding habitats after the mate. They may call periodically from their perches throughout the summer, especially in evening or after rains. They overwinter under shelters of bark, leaves, rocks or logs. They allow most of the liquid in their bodies to freeze, but converted glucose from the liver protects the organs from freezing. The frog is basically frozen until spring. 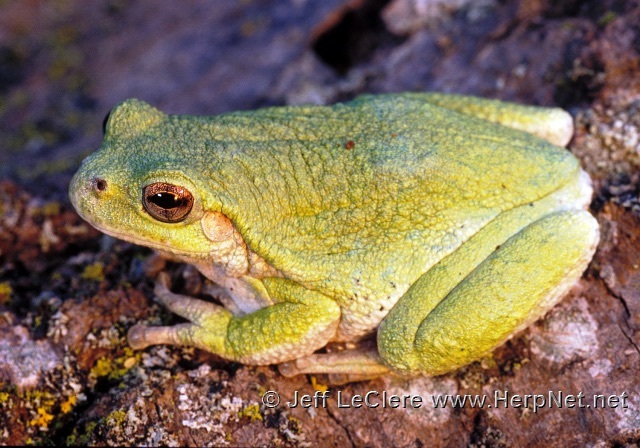 Cope’s gray treefrogs catch insects and other invertebrates for food. They are quite acrobatic catching flying insects in mid air. They hang around street lamps or other lights at night. They are commonly seen on windows and sides of cabins or rural homes at night. They remain hidden in little crevices or other loose shelters during the day. An adult Cope’s gray treefrog, Hyla chrysoscelis, from Clayton County, Iowa.